Home→Bluster Bay Blog→Open-Bottom vs. Closed-Bottom Shuttles – Which Are Best? Open-Bottom vs. Closed-Bottom Shuttles – Which Are Best? We are frequently asked whether open-bottom or closed-bottom shuttles are better. The answer is neither. Which style works best depends on the individual weaving habits discussed here. Open-bottom boat shuttles may be lighter in weight than closed-bottom shuttles. How much lighter depends on the bottom thickness of the closed-bottom version and the wood from which the shuttle is made. An 8-inch black cherry open-bottom shuttle may not be noticeably lighter than its closed-bottom twin. With two versions of a larger style, such as a 15-inch end-delivery shuttle made from a heavy wood like bubinga, the difference in weight may be more noticeable. Open-bottom shuttles are sometimes shorter from top to bottom than closed-bottom shuttles. A lower profile can be an advantage with a loom that makes a small shed. However, if an open-bottom shuttle is designed so that a full quill or bobbin extends below or far above the shuttle itself, the shuttle cannot be thrown easily. Rather than glide through the shed the weft yarn will drag on the warp. A tendency to overfill bobbins will create this problem with any open-bottom shuttle. Weavers who like to pack as much weft as they can on every bobbin are better off with a closed-bottom shuttle. A smooth, solid bottom will glide across a warp no matter how full the shuttle. However, it is worth noting that how easily a shuttle glides, if it is not over-filled, depends more on how smoothly it is finished than on whether or not it has an open or closed bottom. 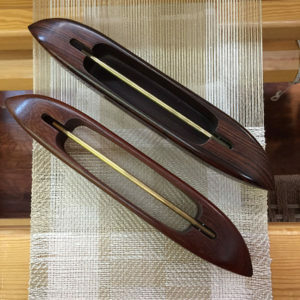 A weaver’s method of changing bobbins may be a deciding factor in choosing between open-bottom and closed-bottom shuttles. Some weavers reach in from the top, grasp a bobbin with two or three fingers and pull the bobbin spindle up. Others only use open-bottom shuttles because they push the spindle up from below. At Bluster Bay we observe that more weavers prefer closed-bottom shuttles. We sell over twice as many closed-bottom shuttles as open-bottom ones. In talking to our customers we find that weavers tend to a have a strong preference as to open-bottom or closed-bottom shuttles from the very beginning of their weaving careers. That preference seems to stem from the first boat shuttles a weaver uses. If you weave with open or closed-bottom shuttles only because your first weaving teacher introduced you to that style, consider trying something different. A switch might solve a problem or annoyance that you thought was unavoidable!